ASHINGTON — As Syria Peace Talks begin in Geneva, America’s key partners on the ground feel neglected, excluded and increasingly receptive to a man who says the U.S has the war-torn country all wrong — Russian President Vladimir Putin. Putin’s government this week used the process of deciding who would attend the negotiations to endear Russia to the Syrian Kurds, whose militia has chalked up high-profile victories against the self-described Islamic State group with U.S. air support. Moscow repeatedly demanded that the talks should include the most powerful Kurdish political organization, the radically leftist PYD. Its co-president Salih Muslim said this week that the party — controversial among Western and Muslim-backed Syrian Arab nationalist groups — did not receive an invitation. The Middle East Eye reported Friday that he stopped by Geneva and then promptly left. Conversely, Washington stayed relatively silent. The Kurds now feel that though they have become close enough to the United States to host America’s Special Operations troops, receive U.S. weapons through a Pentagon-vetted program for an Arab-Kurdish rebel force and share Islamic State targets with American intelligence, the Obama administration abandoned them in the run-up to the high-profile talks, according to analysts close with Kurdish leaders. The popularity of that thinking is a problem for Washington because it could bolster distrust among Syrian Kurds already nervous about their fledgling relationship with the U.S.
American ally Turkey dislikes the PYD because of its links to the PKK, a Kurdish militant organization battling the Turkish state. That’s been a key reason why it did not have direct talks with the U.S. until recent years. (Turkey and Russia have their own tensions, which makes this a point of sympathy for Moscow and the Kurds.) The PYD also has strained ties with many of thenon-extremist Syrian Arab rebel groups that the West has supported since the beginning of the Syrian uprising in 2011. The Arabs see the PYD as too tolerant of brutal Syrian president Bashar Assad, a Russian ally who has an uneasy truce with the Kurds, and oppressive of Arabs in areas the Kurdish fighters now control. Weaker ties with the Syrian Kurds would complicate future U.S. plans to involve valuable Kurdish fighters in retaking major towns like the northern Syrian city of Raqqa from the Islamic State and leave the U.S. with one less viable partner against the extremist group. Analysts and Western officials believe Moscow is exacerbating the split to splinter the opposition to Assad and weaken U.S. influence in Syria. “Russia will seek to drive wedges at any opportunity. Russia only cared about the inclusion of particular groups, like the PYD, when it became a convenient tool for undermining the peace talks,” a Western diplomat told HuffPost. The Russian approach to needling Washington here matches the way Putin has expanded his power in Europe: faced with a hostile government, he deliberately tries to score points with frustrated citizens. The idea of maintaining brutal yet non-religious dictators in the Muslim world is raised as an alternative to President Barack Obama’s approach in debates between presidential candidates on the left and right. This is despite the fact that Assad, toppled Iraq president Saddam Hussein and other ostensibly secular tyrants deliberately fostered fundamentalism in their countries, and that, as Obama has pointed out, the anti-dictator uprisings of the Arab Spring occurred due to local frustrations, rather than U.S. machinations. 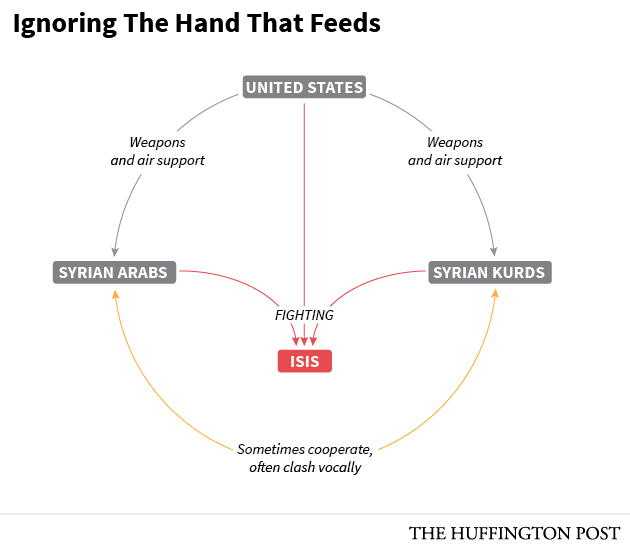 This makes America’s political conversation helpful to Russia and its ally Assad. Though the Syrian dictator’s state-sponsored barbarism remains the main selling point for ISIS recruitment, it’s being talked of as key to Syria’s stability by the two candidates favored by disaffected voters sick of what they see as U.S.-supported regime change: leading Republican hopeful Donald Trump and surging Democratic Sen. Bernie Sanders (I-Vt.). Assad’s forces and Russian airstrikes, meanwhile, focus on fighting nationalist rebels rather than ISIS, while regime policies boost civilian suffering. Meanwhile, the Kurds in Syria and Iraq, seen as less devoutly Muslim and more friendly to the West, are a cause célèbre. Individual Americans and Europeans have even chosen to travel to the region to fight the Islamic State as part of the Kurdish forces. For Moscow to present itself — and, by extension, Assad — as the advocate for the Kurds is smart politics. The move is even more successful because the U.S. here is hamstrung by its ties to Turkey and the rest of the Syrian opposition, seeing them as ultimately likely to be bigger players in Syria’s future. “The [Syrian Arab] opposition has survived five years so far, holding their own against a state in Assad and Daesh. Don’t bet against them,” the diplomat said of the West’s logic, using a derogatory Arabic term for the Islamic State. Sunni Arabs vastly outnumber the Kurds in Syria and their support from their international backers, among them Saudi Arabia, Turkey and Qatar, has grown since the Russian intervention in favor of Assad. The Syrian Kurds know their cause is simply leverage to the Russians, analysts say, and they’re unlikely to choose Moscow as their prime patron over Washington. But they’re doing some manipulation of their own. 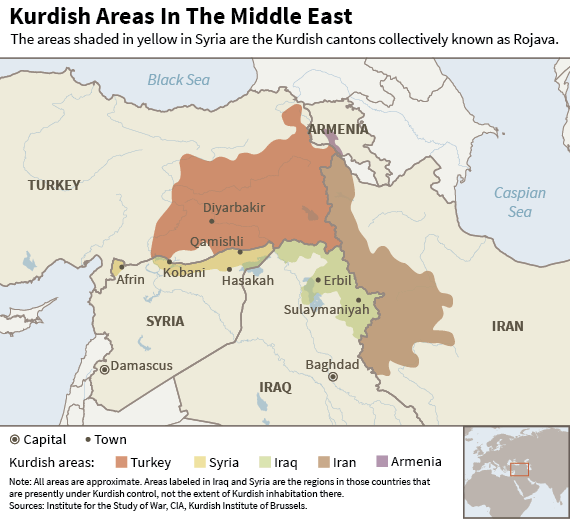 The Kurds’ top priority right now is connecting the third of their autonomous regions in northern Syria, which they call cantons. Their U.S.-supported stand in Kobani and eventual anti-ISIS campaign out of that town helped them connect the two in northeastern Syria, shown in the map below. Yet Afrin, in the northwest, remains apart — separated by a long stretch of ISIS-controlled territory on the Syrian-Turkish border and a slim corridor that Sunni Arab rebel groups hold. “The Afrin region’s situation is getting worse day by the day, with food and medicine shortages and internally displaced people,” Civiroglu, the Kurdish affairs analyst, told HuffPost. He said the siege-caused suffering around the region, home to hundreds of thousands of people, has made the Kurdish militia, the YPG, more focused on pushing through to it. If it succeeds, that offensive will leave Turkey with its biggest Kurd-related nightmare yet: a long, contiguous YPG and PYD-controlled border, which it describes as terrorists on par with ISIS. The U.S. is desperate to keep Turkey pacified so that it will continue to allow U.S. use of its Incirlik airbase for anti-ISIS missions and continue mediating with Sunni Arab anti-Assad groups. So the Kurds know American support for the offensive is unlikely, according to Werz of the Center for American Progress. Analysts say feigning coziness with the Russians could be a way to force a change in American thinking about that potential campaign to the Afrin canton. Max Hoffman, a fellow researcher at the Center for American Progress, noted that the U.S. already launched strikes to support some Kurdish progress there in late December. Russia-backed advances of Assad’s forces elsewhere in Syria are distracting Arab rebel groups that Turkey would be happier to see in control of the corridor, he added. “The end result right now, with Turkey’s attitude being what it is, and the Russian air campaign and the regime’s mild resurgence being what it is, is that corridor remains open and the biggest step we could take to weaken ISIS in its heartland isn’t taken,” Hoffman said. Since the Kurds may move ahead regardless of U.S. support — “just because the US wants to satisfy all groups doesn’t mean the YPG is going to wait for them,” Civiroglu said — kicking up a fuss allows them to test whether that backing might come. For Washington, managing this relationship with the Syrian Kurds will likely become even more urgent, given their frustration and their ambitions. The most important goal is ensuring that they do not end up fully alienated from the non-extremist nationalist Arabs that the West hopes will play the primary role in defining a future Syria that neither the Islamic State or Assad rule. Russia’s determined efforts to portray the Kurds as pro-Assad undercut that priority. The Kurdish response — to insist on a presence at Geneva and to point out how many of the Arab fighters have joined extremist groups — doesn’t help. The best move for the U.S. would be to continue emphasizing the Kurds’ rights to the cantons they have established in Syria, including in Turkey, Werz added. The Obama administration will have to act fast to politically reassure this favored friend, Civiroglu suggested. He said more radical Kurds are increasingly pressuring the PYD party to take a step that might end any U.S.-backed Arab-Kurd unity: calling for full Kurdish independence. “You cannot have a relationship with a group only on a military basis and not a political one,” the Kurdish analyst added.